There was never an intense relationship between me and Filipino food, it was more like a passing appreciation every now and then. Once a year or so I might find myself at a Queens turo turo or somewhere a little more refined like Papa's Kitchen or Engeline's, where non-steam table meals can be enjoyed. 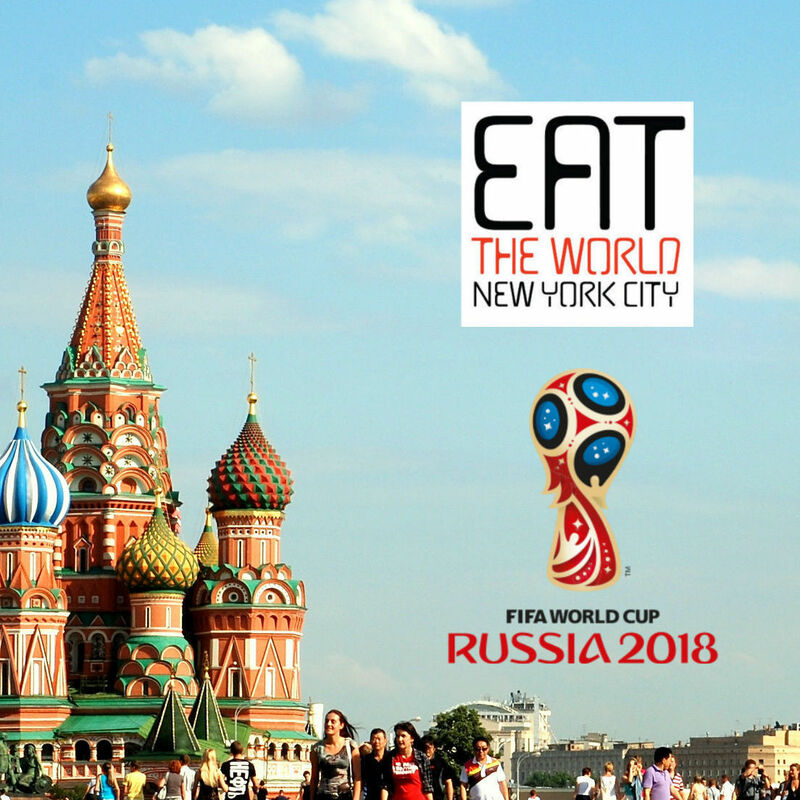 Then I visited the actual country in early 2015 and never wanted to eat the food again. Lovely people, amazing land, sadly the food scene for tourists is redundant and very heavy. After three weeks I could not think of anything I wanted more than absolutely anything else. This is not a fair representation though and I knew it all along, but it took me a year and half to find my way to another Filipino meal. 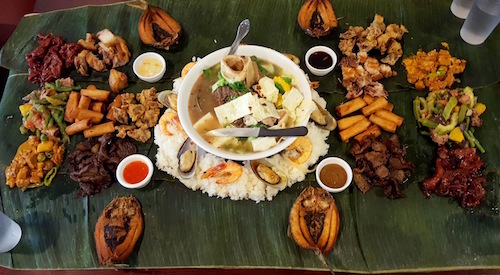 Queens Boulevard has been home to beloved Tito Rad's for a long time, but is now also home to next door neighbor Kabayan, which attracted me with their focus on kamayan dining, or what is also known as a boodle fight. More on that later. To check out the place, I went alone for lunch to scope out some favorites on my own. The word kabayan, it turns out, is the way one Filipino will greet another as countrymen, and this seemed to be most appropriate as even for lunch the place was packed full of countrymen and women. 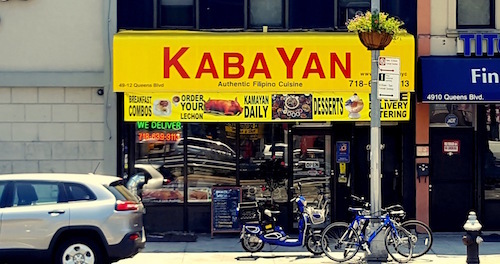 Kabayan seems to have shot up the ranks among Filipino favorites in New York City, and has even opened a second place in the heart of all the turo turo joints on Roosevelt Avenue in the high 60's. Thankfully, it was a good soft landing back into the cuisine. The food here is excellent. 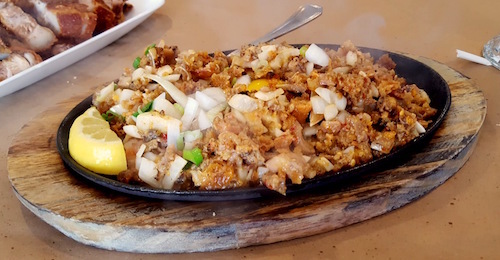 I could not resist ordering the sizzling sisig ($12.95, below), a wonderful assortment of pig parts chopped up and served just like the name suggests. A raw egg is on top, so mix that in and squirt the lemon everywhere. In the Philippines, I noticed the sizzling platters came out more often in other versions than sisig, from bangus (milkfish) and squid to beef and pork chops. All those versions are available here on their very ample menu. In the true spirit of a Filipino eater, I went all in with pork on this lunch and ordered the lechon kawali ($8.95, below), the deep fried pork belly that is served very simply with a side of vinegar garlic sauce. Whether you use the sauce is completely up to you, but the meat speaks for itself. 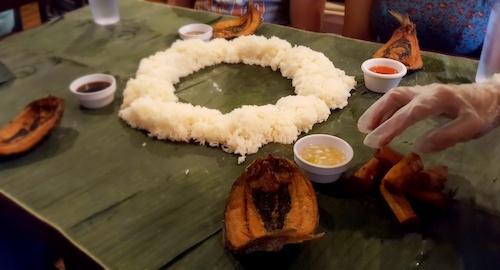 A truly special side of the place is shown in their highly promoted kamayan feast, otherwise known as a boodle fight. For $32.95 per person, minimum of four, diners here can take part in a very fun, thoroughly modern, feast of Filipino classics. 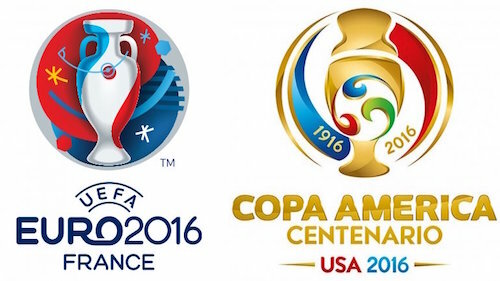 Half of the enjoyment comes from watching its presentation. First banana leaves appear on the table, freshly washed, then a ring of rice is laid down and four different sauces arrive. Each person is given a piece of fried fish and then portions of seven different courses are laid on each side of the rice. Not all of this happens immediately, and things take time to take shape, making the level of anticipation build along the way. It also becomes ridiculously clear that there is no way on Earth that you will come anywhere close to finishing the meal. After everything is placed on the leaves, a gigantic bowl of bulalo comes out, the famous soup of slow cooked beef shank and bone marrow. For a final touch, the ring of rice is topped with prawns and mussels. Where to start? We tried our best, but had at least twice as much to take home as we were able to eat. It is a thoroughly amazing spread. And all of it is properly eaten by hand, utensils are cleared from the table and not offered. Be sure to ask for a glass of fresh buko juice ($3, not pictured), the young coconut juice that will help wash it all down.